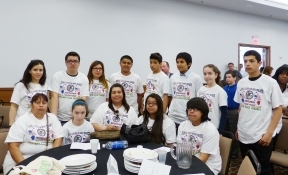 Latinos were among over 350 Youth Leaders, ages 10-21, from the Chicago Metropolitan Area and from north, central, and southern Illinois who came to Springfield, IL on Thursday, May 8, 2014 for Youth Democracy Day 2014, an educational and civic engagement project designed to help young people learn about democracy in action and use that education to advocate for youth program funding. Youth Democracy Day gave these Youth Leaders the tools they need in order to go back to their home communities equipped with knowledge that will help them organize their peers to take action to ensure that their communities become safer, better places. Youth Democracy Day 2014 is an annual event, sponsored by Chicago Area Project with an affiliate network of more than 50 community/faith-based organizations in the Chicago Metropolitan area, and the Illinois Council of Area Projects, 18 independent area projects with over 200 grass-roots affiliate organization throughout the State of Illinois. 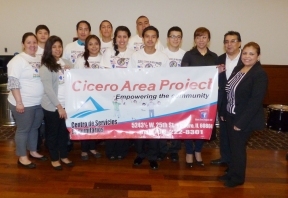 The Latino Youth Leaders in the Chicago Metropolitan Area were from Latino Organization of the Southwest serving southwest neighborhoods in Chicago, Cicero Area Project serving Cicero, Berwyn and Stickney, La Causa Community Committee serving South Chicago and DuPage County Area Project.